Countless waterfalls that inter-connect 16 colorful lakes, all surrounded by lush forest, and unique flora and fauna. A place like no other on this planet. 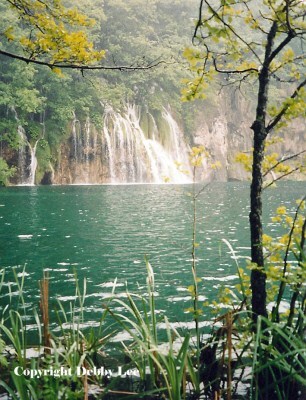 This is Plitvice Lakes National Park in Croatia. Five miles of trails and wooden paths took me and my friend Susan on a day-long journey with nature. We awoke this morning about 8:30, after a good night’s sleep in the zimmer, a private room in someone’s home, in Grabovac, Croatia, a town just outside of Plitvice Lakes National Park. The zimmer was right across the street from where the bus dropped us off last night. We didn’t even have a reservation here, but we got this great room, with a shower down the hall, all for the price of a bed in a hostel. Actually, we got pretty lucky in getting this room at all because all the hotels in the town were already full for this weekend, due to a marathon, of all things. And there are no hostels in this town, my usual night’s place to rest. We had just enough time to get ready for our 9:00 breakfast, included in the price of our room. Hard boiled eggs, bread, cheese, salami, yogurt. A traditional Croatian, even European meal. What was even better, also included in our price, is that the daughter of the owner of the zimmer would drive us to the entrance of Plitvice Park. As we were driving, however, we got stopped by “traffic.” This turned out to be the Plitvice Marathon. The one that all the hotels were booked up for. 49 kilometers, 26 miles, through this area. What a beautiful area to run in, with lots of trees surrounding. We had to wait for about 500 runners to go on the main road that we were on and turn up hill to a smaller road. A half an hour probably passed, but that was just fine. I mean, how many times in one’s life, would one witness a Croatian marathon? We arrived at the entrance to the park, bought our tickets, and got maps of the area in the souvenir shop. It was raining today. At first, I was a bit disappointed, but as it turned out, it didn’t matter at all. In the Croatian rain, and fog, Susan and I walked around Plitvice for seven hours. It was extremely beautiful. Lakes and waterfalls and more lakes and more waterfalls. Countless waterfalls. Blues, greens, azures, turquoises. Plants and trees and more plants and trees. And some wildflowers. It was great to get back in touch with nature. The sound of Croatian frogs accompanied us during our day. We saw a few of them, but mostly heard them. This was very cool to listen to as we walked around. We explored just about every path and wooden walkway that we could, except for one long one around the furthest lake. There were two sets of lakes, the Upper, and the Lower. To get from the Lower Lakes to the Upper Lakes, we took a little boat ride across one of the lakes. 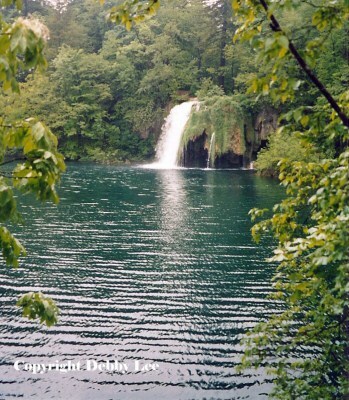 I found out that “slap” is the Croatian word for waterfall, and “jezera” is the Croatian word for lake. 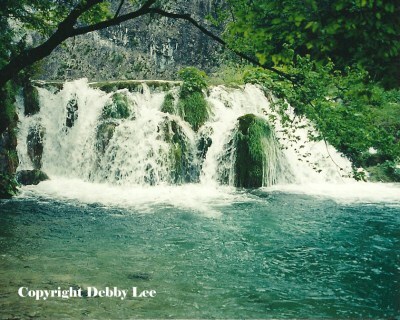 After our walk, we went to the main town of Plitvice, just to say we’ve been there. I bought some postcards in one of the hotels. We then went to a restaurant for dinner by the entrance of the park. But not before I crossed the finish line of the marathon. Yeah, me! (Ya, right…) Actually we just happened to walk by it, so there is a photo of me “crossing” the finish line. For dinner I had a salad and potatoes “baked on a bell.” Not sure what that was exactly, but they were good potatoes. As we were eating, festivities occurred. First we were “serenaded” by a group of people singing Croatian songs. My guess is they were joyous marathon runners. Next a band came over to play – an accordion, a cello, a guitar, and a ukulele. 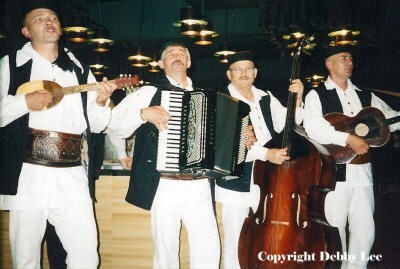 Croatian music, with a bit of “Oh Susanna” mixed in. Then the group singing joined in with the band, and they all started singing together. A waltz was played, and people danced. After dinner, Susan and I were picked up by the owner of the zimmer. I took a nice warm shower, and now I am writing a bit in my journal. I think I will try to figure out where to travel to next in Croatia. But really, I might just be too tired to decide tonight. 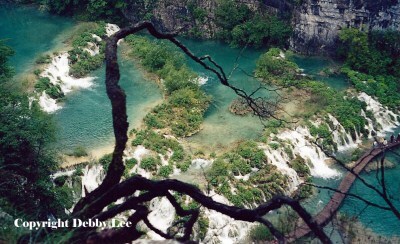 This entry was posted in Croatia, Europe and tagged Croatia by debbysdepartures. Bookmark the permalink. Beautiful! Incredible! I love it!! !